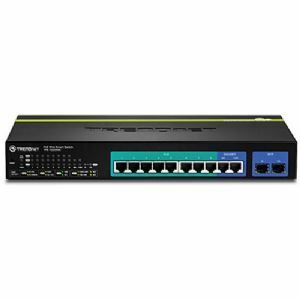 The fanless rack mountable TRENDnet 10-Port Gigabit Web Smart PoE+ Switch delivers a 20Gbps switching capacity with eight PoE+ Gigabit ports and two Gigabit Ethernet uplink ports shared with two SFP slots. 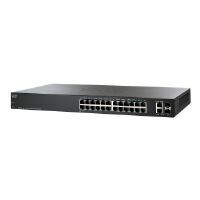 This switch comes with 8MB RAM buffer, 16K entries MAC Address Table, 10KB jumbo frames, and 14.88 Mppst forwarding rates. 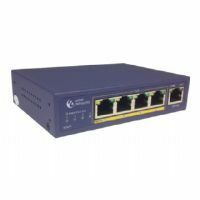 It is also IPv6 ready switch that offers advanced traffic management, troubleshooting, access management controls, energy saving GREENnet, and monitoring features at a reduced cost. Featuring RMON, SNMP, SNMP Trap, and Port Mirroring which support administrator monitoring solutions. The smart fan saves energy by varrying fan speed and use based on cooling needs. So, purchse the TRENDnet 10-Port Gigabit Web Smart PoE+ Switch at the earliest! 13" x 7.2" x 1.75"